Background: Despite the numerous studies about ZIC and ZIC-HILIC retention modes, the mechanism has not been fully investigated and there are no detailed mechanistic concepts in the literature. Some of the pharmaceutical compounds can act as a strong chelator for multiple charged metal ions of biological importance. Trifluoperazine hydrochloride (TFPH) is a strong chelator for multiple charged metal ions of biological importance (Pd2+, Pt4+, V5+) and other metals. It will be interesting to see if the metal–complexes are also separated using the zwitterionic stationary phase. Methods and Result: The study of the influence of pH and eluent concentration of metal-TFPH complexes selectivity should give a clue about the properties of the individual zwitterionic stationary phases and thus about the separation mechanism. The retention factors of Pt(IV)-TFPH, Pd(II)-TFPH and V(V)-TFPH complexes decreased with an increasing buffer concentration. The ZIC5 stationary phase as well as the examined commercial stationary phases ZIC-HILIC and ZIC-pHILIC exhibit the same behavior. 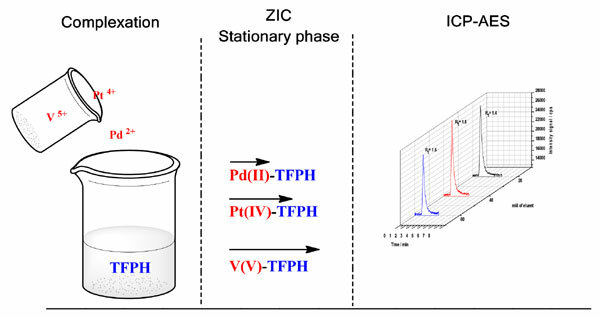 The retention of the TFPH-Pt(IV), TFPH-Pd(II) and TFPH-V(V) complexes with their positive charge decreased on ZIC5, ZIC-HILIC and ZIC-pHILIC columns when the pH increased in the range between 3 to 6. The results of variations of buffer concentration and mobile phase pH show that metal- TFPH complexes can be separated based cation-exchange interactions and electrostatic interaction between the stationary phase and analyte. Conclusion: The current study confirmed the ability of ZIC-HILIC stationary phases to separate metalcomplexes. It could be demonstrated that metal-TFPH separations on zwitterionic stationary phase are mainly driven by a cation exchange mechanism. Keywords: Trifluoperazine, ion exchange, zwitterionicstationary phase, palladium (II), platinum (IV), vanadium (V). Keywords:Trifluoperazine, ion exchange, zwitterionicstationary phase, palladium (II), platinum (IV), vanadium (V). Abstract:Background: Despite the numerous studies about ZIC and ZIC-HILIC retention modes, the mechanism has not been fully investigated and there are no detailed mechanistic concepts in the literature. Some of the pharmaceutical compounds can act as a strong chelator for multiple charged metal ions of biological importance. Trifluoperazine hydrochloride (TFPH) is a strong chelator for multiple charged metal ions of biological importance (Pd2+, Pt4+, V5+) and other metals. It will be interesting to see if the metal–complexes are also separated using the zwitterionic stationary phase.